WASHINGTON (CNN) -- The House of Representatives on Tuesday passed a bill that would make suing for pay discrimination easier by altering a time limit on such suits. 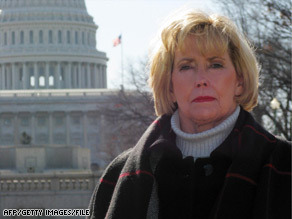 The act is named for Lilly Ledbetter, seen here in 2008. Her discrimination lawsuit victory was overturned in 2007. The Lilly Ledbetter Fair Pay Act, which passed 250-177, would give workers alleging unequal pay the right to sue within 180 days of their most recent paycheck. Current law says such employees must sue within 180 days of receiving their first unfair paycheck. Supporters of the new legislation say that, under the current law, an employer merely needs to hide unfair pay practices for three months before being able to continue them without penalty. The act, named for a former Goodyear Tire employee who sued the company for gender discrimination in 1998, would effectively overturn a 2007 Supreme Court decision on the limit. Ledbetter was awarded $360,000 in back pay by a federal judge in Alabama, but the verdict was overturned in a 5-4 Supreme Court ruling in May 2007. The court said that even though she filed her complaint within 180 days of when she first learned that she was getting paid less than comparable male employees, she had failed to file within 180 days of the first unequal paycheck. After Tuesday's House vote, Speaker Nancy Pelosi said the chamber had "taken a bold step" in passing the legislation. "In doing so, it has injected fairness, reason and common sense back into policy," Pelosi said. The legislation, which passed the Senate on Thursday, now goes to President Barack Obama, who has promised to sign it into law. It is the first major piece of legislation Congress has sent to Obama for his approval. On the campaign trail, Obama and Republican nominee Sen. John McCain debated the bill. Obama heavily emphasized what he called the plan's benefits to working women, while McCain criticized it as a boon for trial lawyers. Pelosi said Obama called to congratulate her on the bill's passage. Obama danced with Ledbetter at one of his inaugural balls, and she spoke at the Democrat National Convention at which he accepted his party's nomination. "My case is over -- I will never receive the pay I deserve," Ledbetter said in that speech. "But there will be a far richer reward if we secure fair pay for our children and grandchildren, so that no one will ever again experience the discrimination that I did."